The evening was started by Chairman Chris, G0IPU who welcomed everyone and said how pleased he was at seeing so many entrants laid out on the desks. Eric, G8ADX (presented by John, G8DET) showed pictures of his new shack & very short "long wire aerial" with house attached in Newton Ferrers, near Plymouth. 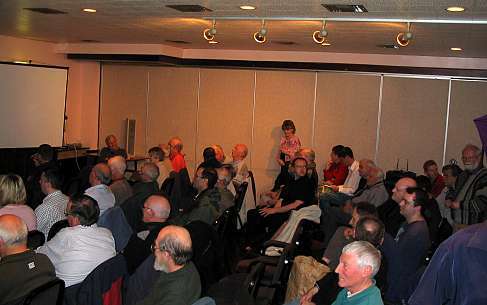 John then showed pictures of his shack with radios and his computer which produced the CARS Web Site & Newsletter electronically. 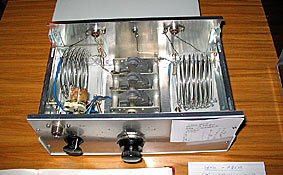 Chris then showed a small die cast box which had been produced by Brian, 2E1RMD and housed a Bi-Directional Inline Wattmeter. Brian said that it was not possible to buy one & he used it every day. It had been tested & calibrated over a large range. Carl, G3PEM showed a Capitance Meter made using a PCB he had purchased 20 years before. 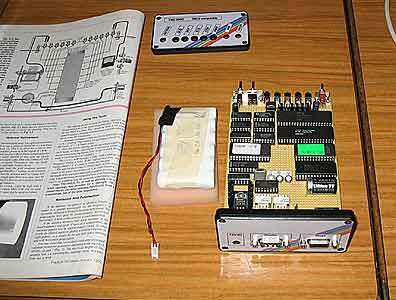 It used the 566 chip & would measure from a few puff to about one Micro-Farad when he said that he could read the printing!. Dennis, G8AAE said he needed a small PSU and told the audience how he had made his. 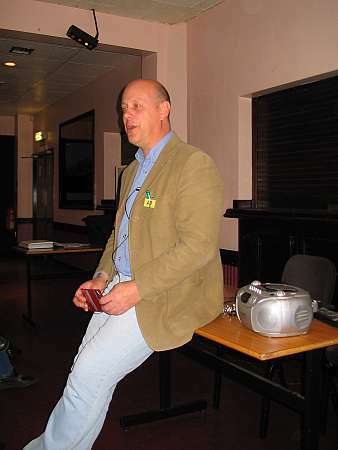 Geoff, G7KLV stood up and informed the audience that his presentation worked but after last years poor demonstration he was not going to prove it this year!. 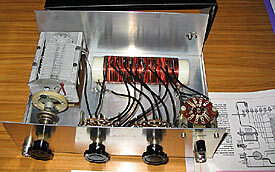 It was a Low Level AC Voltmeter which worked from a few milli-volts to just over 1Mhz - so he called it wide audio range. He commented that marking was a problem with all home produced equipment. 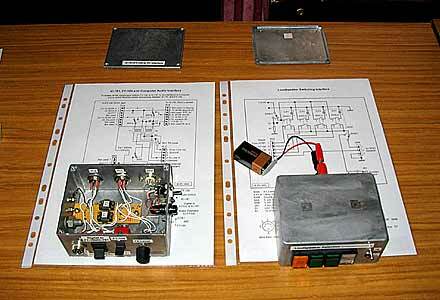 John, G1UZD showed a Switch-Box to enable a quality loudspeaker to be used with two or more rigs. 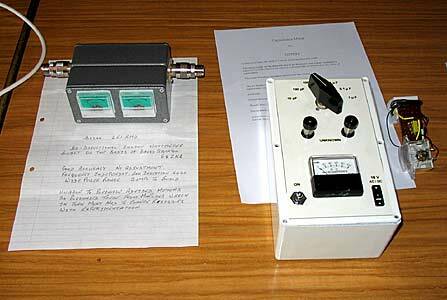 The same principle applied to another Switch Box for his IC781 to FT100 & computer interface. Again he commented on the problems of marking and said he used a little know program on Microsoft Word called "Drawing". With this he had produced beautiful sign-writing on his switch boxes & information sheets to remind one of the pin numbers etc used. The quality was of better standard than many handbook drawings produced professionally. 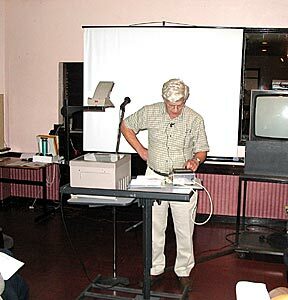 John agreed to present a CARS Lecture at a date in the future on the subject using his Laptop & the digital projector. Denis, M0FHA showed two Aerial Tuners. Each used beautifully wound, taped coils and variable condensers cleaned with Backing Powder. They were supposed to tune anything but he said 160 Metres had defeated him because the capacitance was not high enough - good on all other HF Bands though. Colin, G0TRM amused the meeting by producing a range of Thermos Flasks, one from which he had a drink - the others produced enhanced audio. Anthony came in late from work with a very professional looking TNC he had built & designed from a number of proven sources using what "old" chips he could find. It was built on Veroboard and took over 2 days to wire pin to pin using fine blue covered wire. 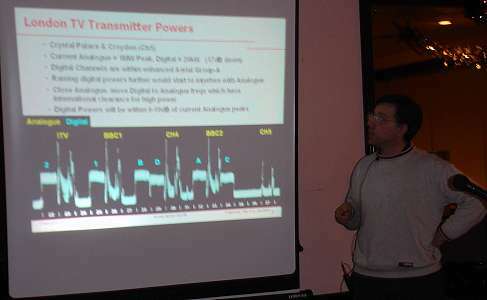 He had used the unit to make a number of digital QSOs. Last up was Chris, G0IPU who showed a car tracking device using 2Metres which he had made. All in all a very interesting evening with CARS voting who won the many awards. After the break, Trevor showed the new RSGB promotional DVD on Amateur Radio. There was the usual great Raffle. 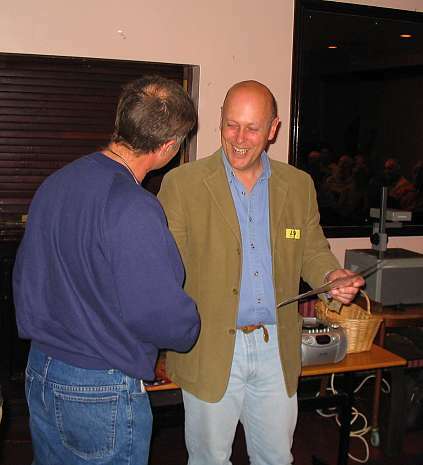 Don was a Planning Team Leader for this DXPEDITION to Rodrigues Island in 2004 with the now famous call-sign 3B9C. Rodrigues Island lies 560kms to the east of Mauritius. The DXepedition was organised by the Five Star DXers Association. (FSDXA). The mission of FSDXA was to provide amateurs around the world with the opportunity for a least one contact with the station. Members of CARS worked 3B9C. Don gave a run down of the equipment used and showed pictures of a container with 6 tonnes before being shipped. They put on 15 stations on every band which could be worked from 160 metres to UHF. About 150,000 contacts were made. After the break Murray, G6JYB brought us up todate with the latest on the Ofcom situation. He described the number of Ofcom papers which had been issued & said that CARS had submitted a Marintime Response along with a personal one from John, G8DET. See Ofcom sub-page & Marintime page for details. 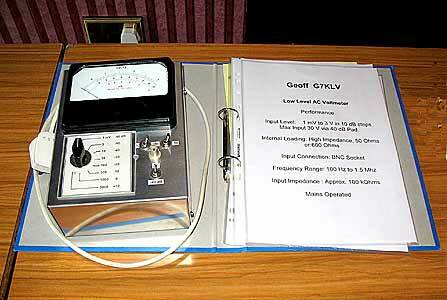 The reason for responding to the shipping consultation document was that it is thought to shadow that which will be issued later in May for the Radio Amateurs. Although it was a long meeting all agreed it was another "good CARS event". Tuesday 5th April, 2005. BBC Essex. 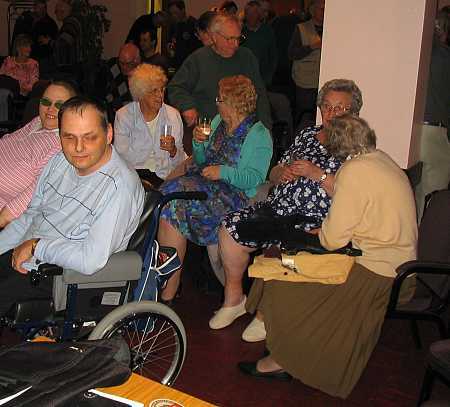 Simon came "Off-Air" from BBC Essex, Chelmsford straight to the Marconi Club in Beehive Lane looking amazingly fresh. Incredible really, considering he had just finished presenting his "Drive Time" programme from 4 to 7PM. Chairman Chris, G0IPU introduced Simon with a fabulous tape recording that Colin, G0TRM had recorded earlier; Simon trying to tell the county he was later entertaining the Chelmsford Amatuer Radio Society, whilst a phone-in woman was describing how she was getting ready to eat lamb chops and mashed potatoes for tea! Simon Baldock relaxed talking to CARS. Brian, G4CTS with the ladies. Simon humourously told us of his job experiences before becoming a radio presenter. They included training to be a chef, estate agent, van driver, crew member on a luxury yacht, publican and volunteer with BBC Essex. In the end though, he loved the radio so much that he decided to stay and eventually, through perseverance, got a position as a top radio presenter. He told us that many radio programmes you listen to today are all loaded up on a computer complete with over 1,000 songs which can be "drag & dropped" into a play list. Mind you, he added, this is fine until the computer crashes - as it did today!. Then it's back to doing it the old fashioned way - manually and thinking on your feet. Simon played us some sound tracks of classic BBC interview errors and told us interesting stories of interviews he had carried out with the stars - his favourite of all jobs! After the break, Simon drew the 21+ prize raffle! Jackie M3TWO (Wife of David M1DCJ) choosing a raffle prize. 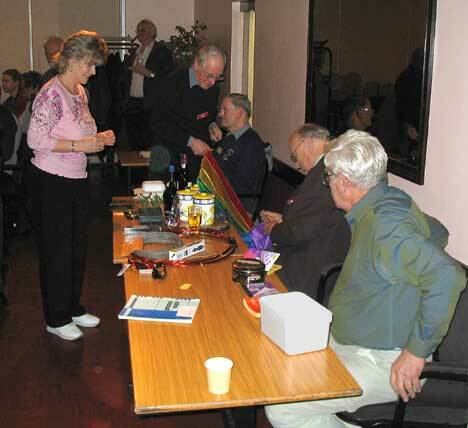 The Raffle was run by Tony G4YTG & Geoff G7KLV. 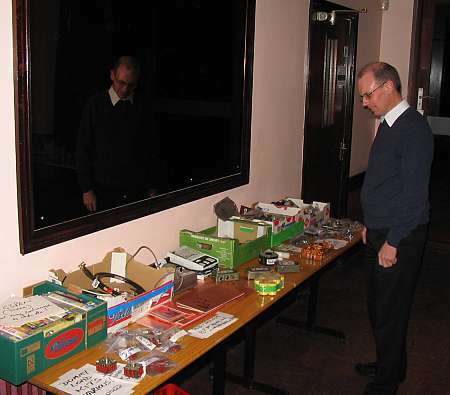 Trevor, M5AKA looking at the table of goodies Dave Penny brought in to sell. A thoughly interesting night presented by a truly professional speaker - thank you very much Simon Baldock. Tuesday 1st March, 2005. The RSGB QSL Bureau Update. The RSGB QSL Bureau is a service provided free for Members and is run by volunteers. For the benefit of new Members it enables QSL cards to be distributed cheaply, avoiding postage costs on each card, although, it has to be said, it is inevitably rather slow. In essence you send a bundle of cards to the RSGB and eventually you get a bundle back from them. Marc Litchman of the LEFARS Club came along to tell us all about it. He said he came to our Christmas Social so knew where we were. 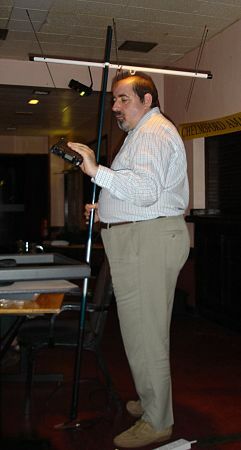 Marc used a laptop to tell us about the logistics of the QSL Bureau and his relationship with the RSGB QSL Bureau. 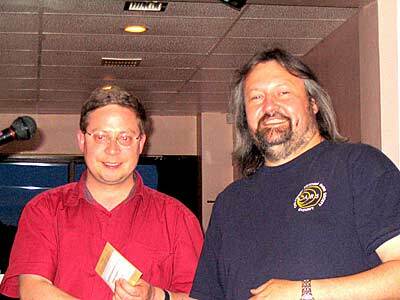 He told us that RadCom was reviving the RadCom QSL column. 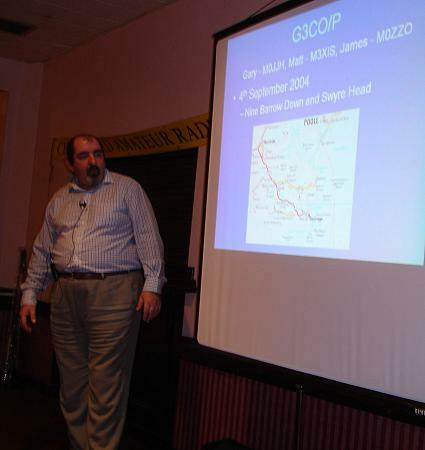 He then told us about the problems of running the G7 QSL Bureau - he has dealt with 8,000 QSLs since taking on the job. To aid managemt he has all of his "customers" logged in an Excel Spreadsheet which took a lot of work initially but saves looking up in the basket to see if there are enough envelopes for the latest batch of cards received. This was a an interesting meeting and no doubt everyone learnt a little on how to make a QSL Managers life a little easier. Always put 2nd Class Stamps on the envelope as they are still effective after a stamp price increase. Some unusual QSL cards were circulated for others to see. Fortunately, the very cold and snowy weather of the previous week had been replaced by wind and rain & so did not disrupt travel too much. Chris, G0IPU Chaired the Meeting. 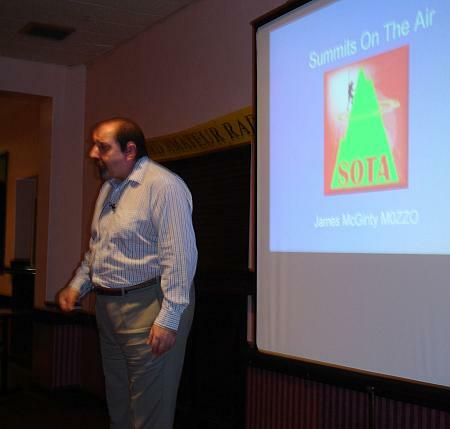 James, explaining SOTA to a large audience. Thank you James for a very well presented meeting. Pity Danbury Hill does not qualify for a SOTA Award. More will be written here when available. It doesn't seem all that long ago that Murray introduced us to the concept of Freeview and Digital Television. 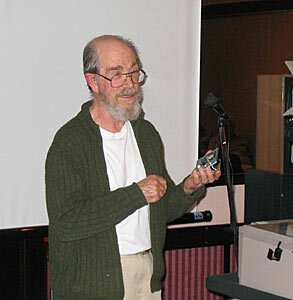 It was his talk back in December 2002 that inspired us to get a DigiBox. The BBCi Weather (Press the RED Button) for Chelmsford weather is the best on the "Box". He told us about the plans being drawn up for the great changeover. A couple of remote Welsh villages are being used as guinea pigs with DigiBoxes supplied free to the 800 viewers affected! 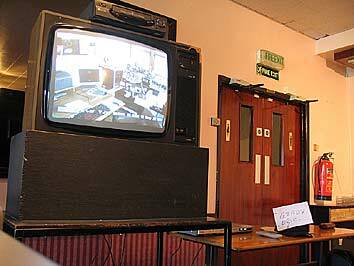 In fact their changeover started on the 29th November 2004 and their analogue TV will cease to operate in late February 2005. The experience gained should iron out problems that will inevitably arise before we all follow suit in 2007-2012. It all sounds quite exciting. It shows a panoramic display at one instant of the spectrum from 470 to 650 MHz. It shows clearly the high power Video signals from Crystal Palace of ITV (left), BBC1, Ch4 & BBC2. Channel 5 is the lower powered signal on the right from Croydon. Notice how the 6 Digital Mux signal sits so much lower down. He also told us more about DAB/DRM which will eventually be replacing AM and FM radio. Already people spend more money on DAB than ordinary radios, and more more spectrum is likely to be released in Band II for this. If you would like to see all the 31 slides Murray used for the above talk, click below. It is a PowerPoint File of about 542 KBytes & if you are on Dial-Up it maybe easier to "Save them to your computer" rather than watching them on-line. Click below. Having looked at them, click on your browser's BACK button (top left) to come back to this Web Page. Murray's Slides in PowerPoint (ppt) - 550kbytes.